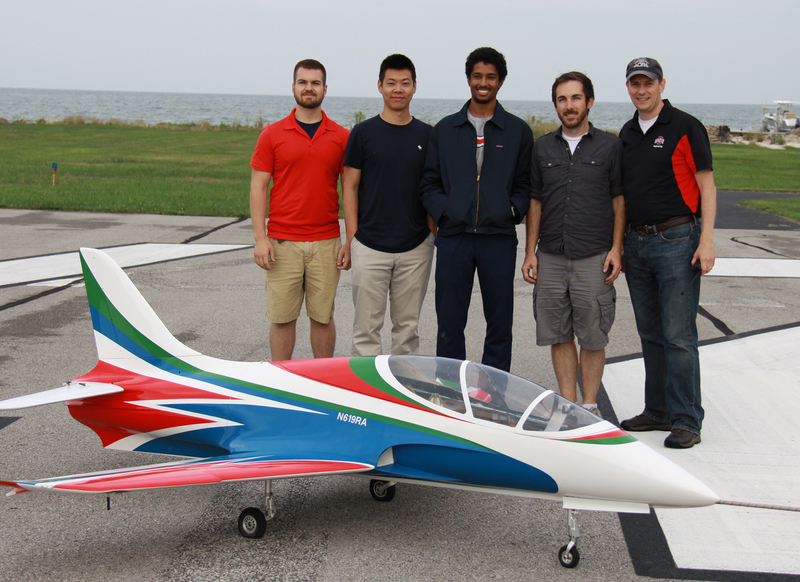 Team members (l to r) Mark Sutkowy, Wenbo Zhu, Ryan Thorpe and Matt McCrink with Prof. Jim GregoryThe record flight occurred on Wednesday, August 30, from Kelleys Island Airport, Kelleys Island, Ohio, with the course extending to the east over Lake Erie. The Ohio State team of engineers overcame technical challenges such as fuel limits for the 17-minute flight, radio range for maintaining positive vehicle control, and collision avoidance. The 70-pound autonomous jet aircraft opens up new capabilities for applications such as rapid package delivery or search-and-rescue, where both high speed and long range are mission critical. The Ohio State-designed jet UAV is uniquely equipped to handle this mission, with custom-built flight controller, long-range fuel tanks, redundant radio control links, control via satellite communications link, and ADS-B in/out transponder technology for avoiding collisions with other aircraft. Led by Engineering Professor Jim Gregory and Research Scientist Matt McCrink, the university’s team collaborated with Ligado for the satellite communications and with uAvionix for the ADS-B transponder. The official record is pending review and certification by the National Aeronautic Association (NAA) and by the Fédération Aéronautique Internationale (FAI). An official observer representing the NAA was present for take-off and landing. Ohio State is a world-leader in the area of UAV technology and policy. Over 40 faculty are actively involved in research related to UAVs, spanning the domains of all-weather operations (robust flight in wind gusts and icing), flight testing, human factors, control link security, precision agriculture, regulatory policy, navigation system performance, vehicle control and networked operations. Ohio State also is a core member of the FAA ASSURE Center of Excellence, with a research focus to enable safe and efficient integration of UAVs into the National Airspace System. Media outlets interested in interviews with team members or additional images and video, may contact Matt Schutte.9@osu.edu, 614-247-6445.